Curiosity Disruption : Executive Leader Coach @ dbkAssociates, Inc.
As mentioned several times on this blog, curiosity is a common trait of successful leaders. Many leadership coaches consider curiosity to be a requisite leadership strength. Also, on the blog, I have mentioned that one’s strength is also a weakness. How do these two precepts jibe? When is curiosity a weakness? The employees of highly curious leaders often complain about constant change initiatives. It seems that every time their leader wanders out on to the floor, they ask myriad questions about what’s going on. Why do we do this, that, or the other thing? When the employees do not have a ready answer, they are usually asked to investigate and report back to the leader. Following the investigation, there may be a change initiative to instigate a better way of performing a given task. When the boss goes off to her peer advisory board meetings or an industry conference, she often comes back all excited about a new leadership concept, or the latest productivity improvement software. Moreover, that means additional work for her employees. They must learn how to use a new business process or software package. 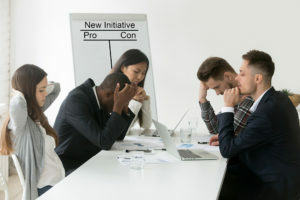 They may be required to lead a change initiative in their department or be on a cross-functional team to implement company-wide process changes. They may be expected to do all this while not missing a beat on their existing work products. I own this challenge. I am so curious that I can very easily take myself and anyone else who lets me down a very long rabbit hole! I like change and continuous improvement. While that is normally a good thing, I can easily overdo it. As leaders, we need to take stock of how often we are creating disruption and losing productivity due to our self-inflicted change initiatives. At the same time, we need to consider the need to keep the organization moving forward and not becoming stagnant and irrelevant to the markets we serve. Most employees, left to their own devices, would rather not be required to change. They generally prefer the status quo. There are exceptions, and I’ve always been one of those exceptions. Moreover, my need to see change and constant improvement is disruptive to people. So my challenge is to balance the time the organization has to settle into new processes and procedures with the need to keep up with the rapid pace of change in our marketplace. How about you? Are you driving your people crazy with your curiosity? Are you providing some settling time? How do you evaluate the need for change, prioritize change projects, and calculate the ROI on your change initiatives? « What Do We Expect?